Check out the Articles section for good cooking information. CookingLouisisana has a new look. Click here to go to the new Site. The Stuffed Crab recipe has been modified. The Deer Roast recipe has been modified. Cooking Louisiana is the place where the "Cajun/Creole" home chefs meet. If you love South Louisiana (Cajun & Creole) home cooked meals, or, want to know more about them, you should enjoy yourself here. 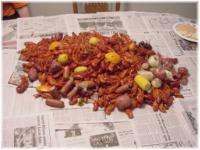 Cajun Cooking and Creole Cooking dominate South Louisiana, Cajun Cooking being the most popular. Fact is, Cajun Cooking and Creole Cooking couldn't do without each other! That's why you'll often see references to the combo as Cajun/Creole Cooking! No matter what, it's all good. You'll peer into the dishes of the actual residents of this flavor filled part of the southern United States. We'll also get into some cooking facts and information on how YOU can be creative with the preparation of your favorite foods, the Cajun way! Cooking can be artistry, that's why the famous chefs are famous! I've learned a lot in my cooking studies about how the great chefs do it... but not enough to hurt my cookin'! "Make yourself at home, there's the ice box...get what you need, the forks and knives are in that drawer and the plates are up there. If you leave here hungry it's your own fault!" Pass the site on to your friends, unless of course, you want to be a better "Cajun" home chef than they are....!